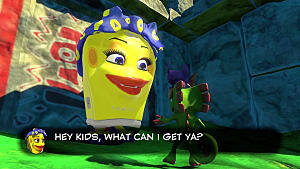 Whether you like Capital Cashino or not, if you want to 100% Yooka-Laylee you've got to get all the collectibles within. 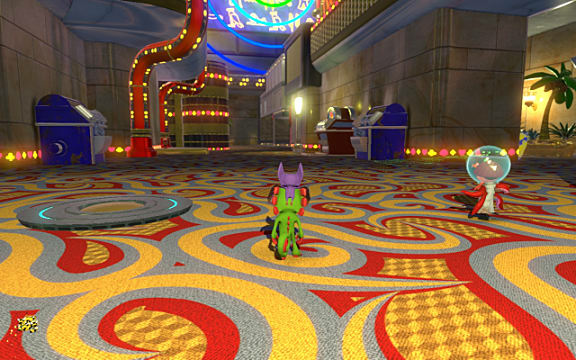 Capital Cashino feels like the smallest world in the game. Despite that, there are still a number of nooks and crannies that are easy to overlook -- and accidentally miss what you're looking for. 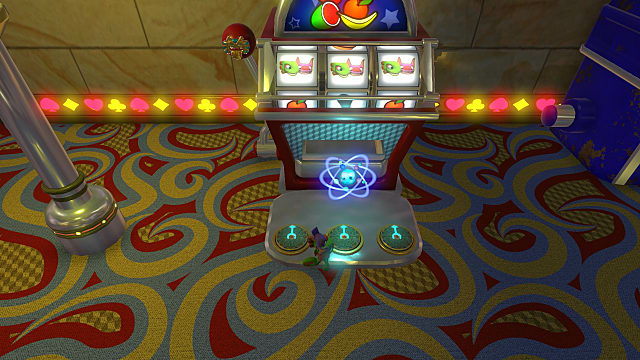 Collectibles are hidden in slot machines, off-shoot obstacle areas, and almost in plain sight (if you know where to look). Dealing with this world is certainly different from the others. 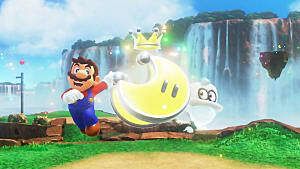 This walkthrough guide will cover finding the Butterfly Booster, Mollycool, Power Extender, and Ghost Writers found in Capital Cashino, and attempts to avoid spoilers. 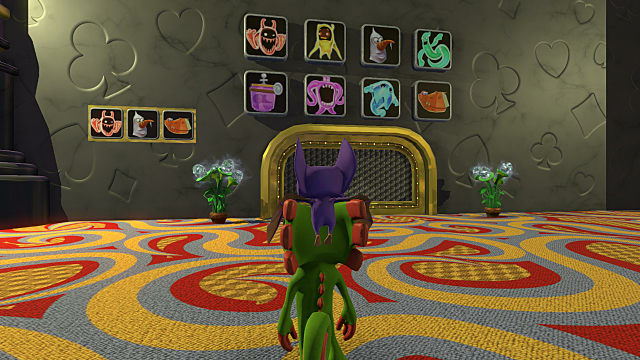 Each collectible has pictures to help guide you, whether you've got the additional maneuverability the skills you get at endgame or not. Do note this guide assumes you have already expanded the world and does not mention whether you can find these items before or after expansion. If you've been playing the slots like you should, you may have come across this Mollycool already. 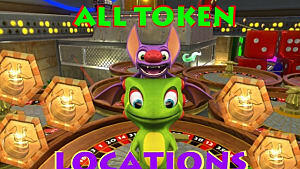 Find Dr. Puzz near the entrance (take a right at the coin counter, then a left) and then head toward the functional slot machine nearest her. 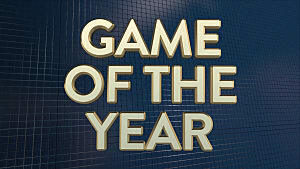 It's the red slot machine pictured below. 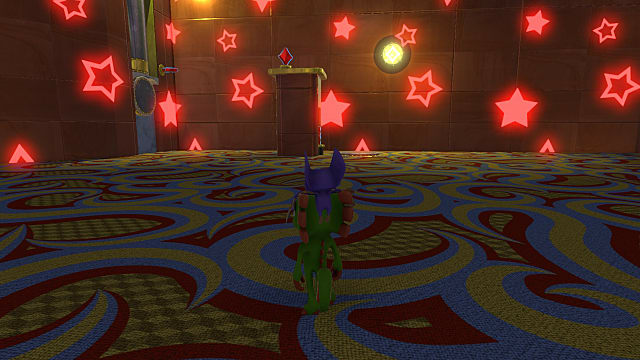 Win at slots and you will be awarded this world's Mollycool -- and so close to the D.N. Ray! 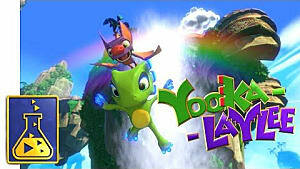 This one's easy enough once you can fly, and even if you can't you can transform into a helicopter via the D.N. Ray and make your way up to it. 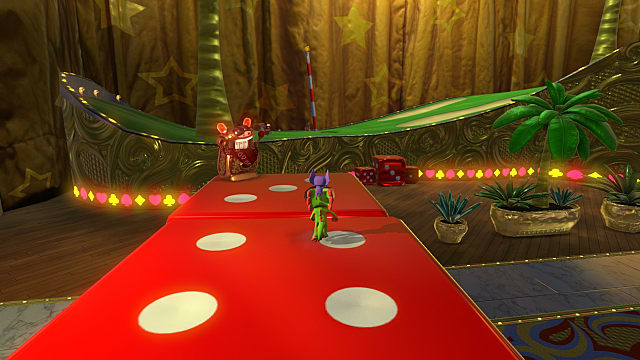 Simply fly toward the fountain in the middle of the world and flutter up to the ceiling to grab this Butterfly Booster. There are two main ways to get it, but here we're going to focus on one here. 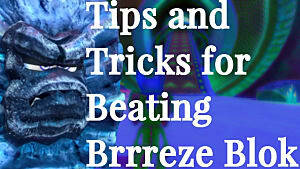 Make your way up onto the golf segment of the level. 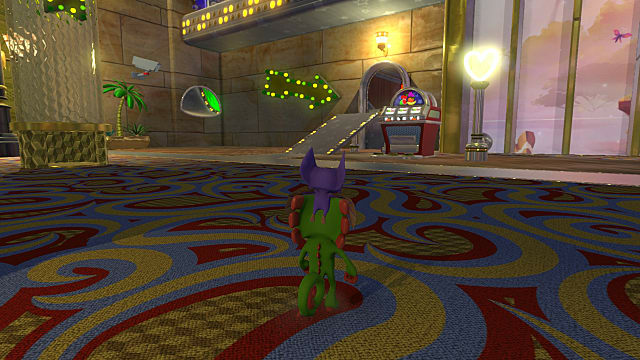 You can find it on the furthest side from the entrance to Capital Cashino. The easiest way to get onto the golf area is to use its small dedicated elevator in the back right of the world. 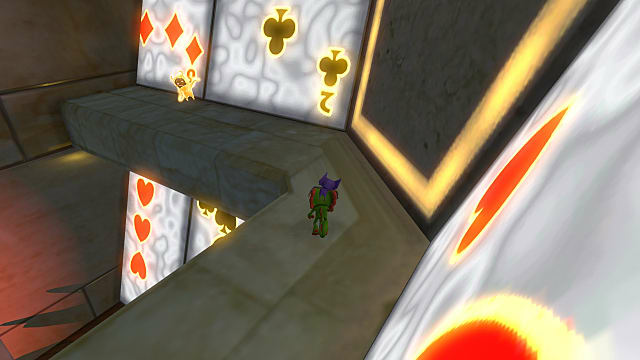 Whether you get up here via another route or the elevator, you need to be at the start of the course. This is where the elevator takes you to. Turn your camera and look at the wall to see where you need to go. You should see a floating platform bridging the gap between the course and the wall. 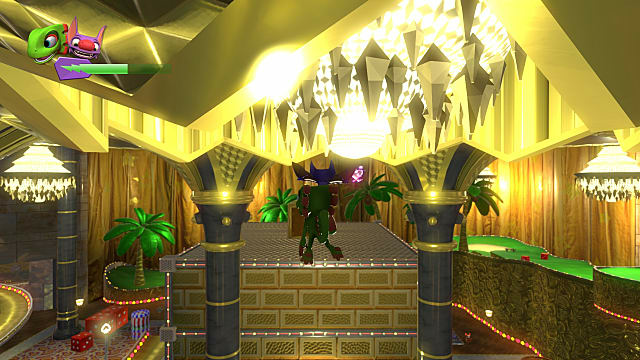 From here you can either take the platform over and spring jump up onto the vent pictured or you can stand on the very edge of the golf course and glide over into the vent directly. 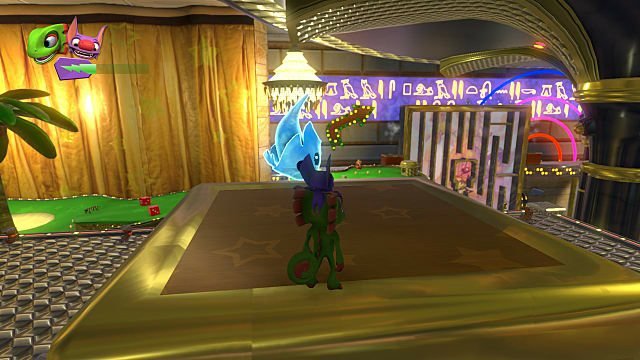 In any case, you get lifted up and can grab the Power Extender on the ledge above. 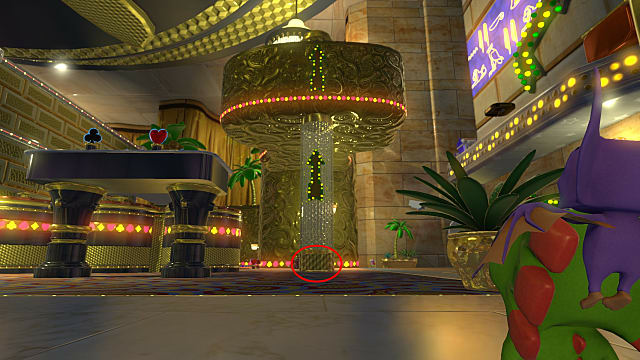 Make a left right at the entrance of Capital Cashino and find the small pillar pictured below. 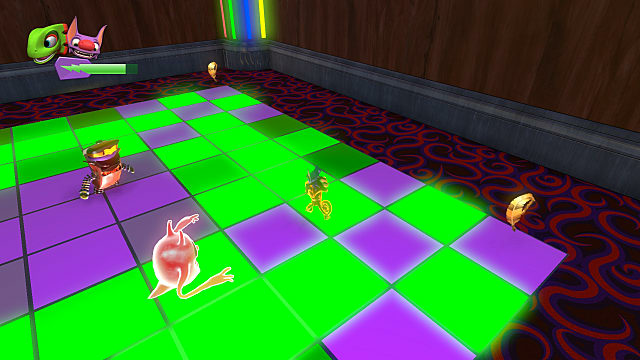 Use your Sonar Shot on the glowing diamonds to get through this obstacle area. Once at the top, turn the camera around and you should see the yellow Ghost Writer standing on a ledge on the building covered with cards. Glide over and you can grab it up. This one is actually relatively easy to find as long as you pay attention to your surroundings. 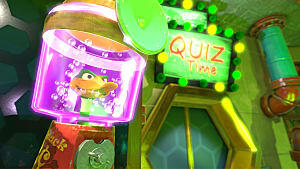 Look for the puzzle pictured below, which opens up an obstacle area with multiple variations of the same type of puzzle. You can find the pictured spot on the left side of the world. 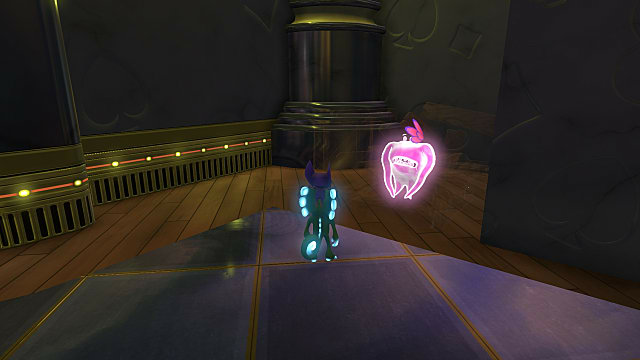 The pink Ghost Writer is hiding in one of the rooms and can easily be fed a snowball to be collected. 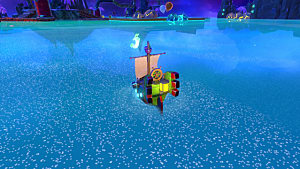 You have to be able to fly (Trowser's last free ability) to reach this one. The image below shows just where it is. 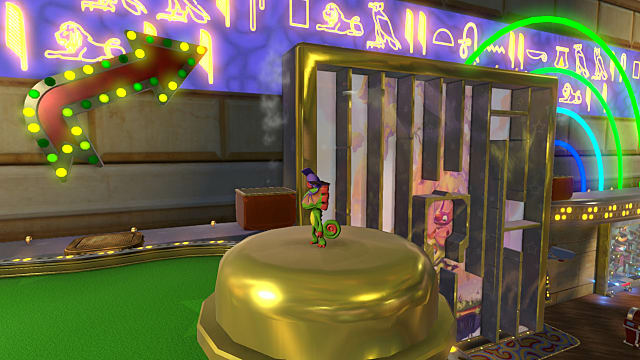 The Green Ghost Writer is found on top of one of the sets of elevated spinning roulette wheels. 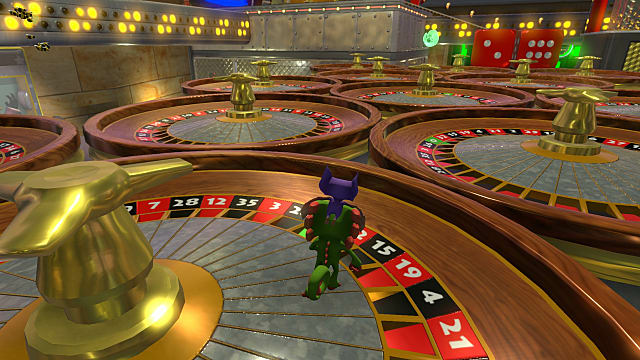 If you don't have Trowser's last free ability yet you'll have to look for the poker chips pictured below, which are between one set of roulette wheels and the golf area. 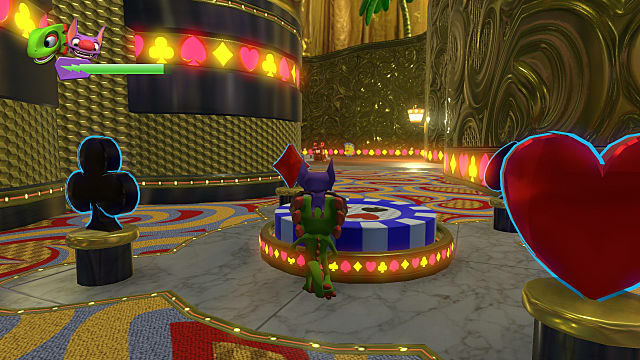 Use Sonar 'Splosion while standing on the poker chips to activate the card suit symbols and get lifted up. Once you've been lifted up, turn left and make your way to the other set of roulette wheels using Sonar 'Splosion in a similar manner as before to cross to the other set of roulette wheels and find this Ghost Writer. 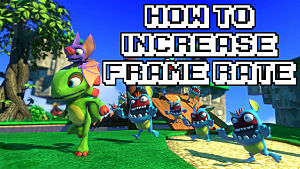 This is another one you should find pretty easily as you're looking for Pagies, as long as you've gotten Reptile Rush from Trowser. Look for the door with the arrow pointing to it pictured before. It can be found on the right side of the world near the back. 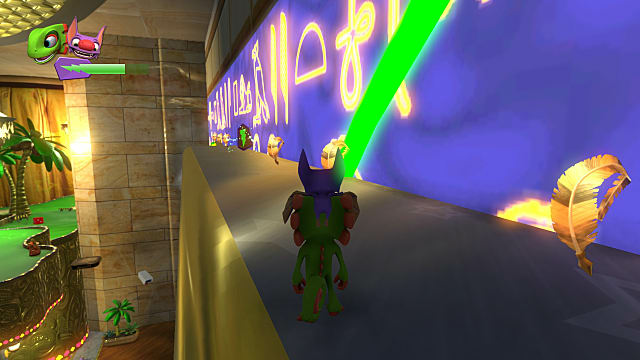 This Ghost Writer can be plainly seen in the obstacle course in this area, and can be quickly pummeled into collection.